Cheap way to add wireless to your system. You'd be hard pressed to find a modern day laptop without built-in Wi-Fi. The same isn't true of desktops—motherboards with integrated Wi-Fi are out there, though oftentimes they come at a premium. If that's the boat you're in, the easiest (and cheapest) way to add Wi-Fi to your system is with a USB adapter, and right now the Asus USB-AC55 can be had for $14 and change (after rebate). Newegg has the USB-AC55 on sale for $43. Using promo code 0125PBCS05, you can knock 20 percent off to bring the price down to $34.39, plus there is a $20 mail-in-rebate available. Taking advantage of both brings the eventual final cost down to $14.39. Amazon also has the adapter on sale for $34.39, and without having to enter in a promo code. There is a rebate form available too, so the final hit to your finances after rebate is the exact same. 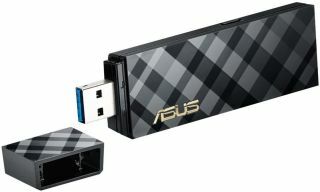 The USB-AC55 is a dual-band wireless AC1300 adapter. It offers of up to 867Mbps on the 5GHz band, and up to 400Mbps on the 2.4GHz band using 256QAM technology (you'll want to plug it into a USB 3.0 port for best performance). Asus does not list Windows 10 compatibility on its product page for the USB-AC55, though if you hit the support section and navigate to Driver & Tools, you'll find both a Windows 10 driver and a utility for Windows 10. If you're using Windows 10, you'll want to download these from the website rather than installing from the including disc. Here is the Newegg link and here is the Amazon link.